You might remember that I recently cleared out my oversized or under appreciated clothes to unclutter my drawers and make way for the "new" style of things that would reflect (the new and improved, lol) me. The weather is warming up in Perth and I had just one pair of shorts to wear. They were a pretty plain beige pair I picked up at the op shops last year for casual use around the house. They just weren't going to take me far into summer alone. I decided a trip to the op shops was on the cards to rectify the situation. I was struggling to get there until we miraculously had free time on Saturday morning, after a very quick stop at the air conditioner shop, hunting a split system to install in Turtle's room. We have conceded we need to install one after the stress of shifting her back and forth between our room and hers last summer. There are three op shops within walking distance from each other near our house. We only had time for one and it came through with the goodies. Apart from shorts, I also need casual (but not too casual) t shirts. 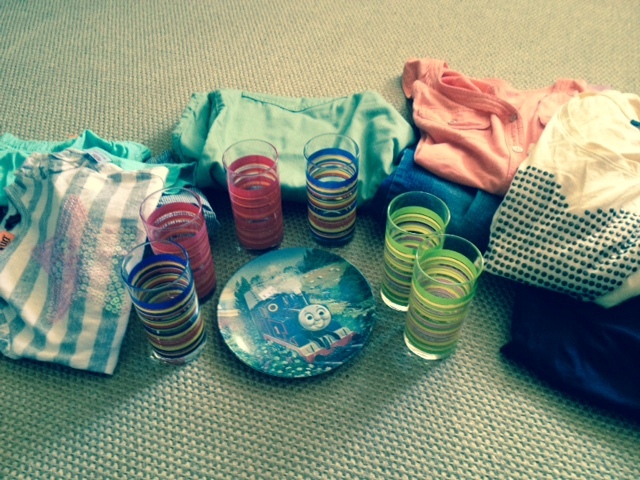 Turtle has a mix of gifted summer clothes for her birthday and secondhand clothes from a friend. She was, coincidentally, also needing new shorts. Her size 1 clothes are just fitting her so we will need to upsize through summer. I went straight to the women's clothes section (spurred on knowing Turtle would need a nap shortly) and found so many t shirts and shorts that I liked. After my recent shopping experience I have taken a liking to flowing tops. I found a yellow flowing t-shirt with a big studded love heart that I loved but hesitated to buy. The idea of wearing a love heart in public seemed kind of weird to me. But I loved the yellow colour and the faded gold metal of the studs was really simple and not flashy at all. I'm so glad I gave it a go. I really like it. I also found an orange button up sleeveless top that is great for casual wear, albeit a touch baggy on me. There were a range of shorts that I actually wanted to try on. That was surprising since I struggle to find shorts I like. They are often too short or too baggy and shapeless. It is hard to find a flattering style that is in a good colour to mix and match. I bought two pairs of fitted long shorts (almost like cut of jeans) in black and denim. I also bought a pair of stripy purple and white shorts, inspired by Turtle's favourite colour. While I was busy sorting myself out Turtle was happily playing with the myriad of toys that the op shop had for sale. They had keyboards, the little plastic balls in a bag (think Maggie getting lost in the ball play area in the Simpsons), and activity tables just to name a few. We somehow refrained from buying any toys. Mr Fix It was on task looking for size 2-3 summer clothes for Turtle. We ended up buying some Country Road stripy cargo shorts for her (I'm not sure if they are boys shorts but I'm sure no one will notice) as well as some casual green shorts. We also bought a gorgeous grey and white stripy top with a sequined pink star on it for her too. It turns out Mr Fix It has found himself similarly depleted of shorts in the lead up to summer. He also, surprisingly, found a nice green pair of green shorts that fit him well. I think you will agree that we were doing extremely well at that point. To buy one item of clothing on a shopping trip can be rated as a successful outing. To buy 6 pairs of shorts and 3 tops is pretty impressive. With a price tag of less than $50 for all of it we could not complain. The final moment of joy from this experience was finding a Thomas the Tank Engine melamine plate for Turtle, which reminds me of visiting grandparents as a child, and a set of striped colourful summer drinking glasses, which we needed. I paid around $50 for it all and then realised, when I got to the car where Mr Fix It was sorting out a pooey nappy that had presented itself in the changerooms when Turtle decided to "try on" her shorts, that the check out boy had forgotten to charge me for a few items. I went back in to get him to ring through the difference (he had taken a call while serving me and I had put some things in our bag that he hadn't rung through yet) and another customer commented how honest I am. The sales boy (he was so incredibly young I can't call him a man!) agreed. I pointed out I was already getting bargains and the money was going to charity.. Why would I bother stealing? I felt so lucky to have found such wonderful things and to be paying so little for them. If I had bought all of that new I would have paid over $200 easily. Since this expedition we have had a few spells of warm weather and I have happily worn all of my new things. It feels great to have some new favourite clothes to wear. Have you been shopping your way into summer? Have you been lucky enough to score some new favourites too?